We negotiated with the factory to get the best price. They won't last long at this special price. Join our newsletter for updates on this bike. Did your size/color sell out? Improves on the Fast, Simple, Classicly cool, Kilo TT - Now Three times better than the original. The Kilo S3X is equipped with the trick and high tech, triple-gear, fixed hub by Sturmey Archer. This three speed fixed gear hub is your super-secret-weapon. The simple, direct feel of a fixed gear hub, with the ability to shift down for a hill! High technology hub-gear maker Sturmey Archer has just the thing: the new S3X Fixed Gear Hub. It is old school mixed with some very high-tech. The S3X is an aluminum fixed-gear hub with three speeds. The difference between this and any other three-speed hub is that there is no freewheel, meaning that, like any fixed-gear, the pedals are always moving. Top speed runs direct, and when you shift down you’ll get -25% and -37.5% of the third gear. This ability to down-shift while pedaling will allow a rider to conquer hills and obstacles with greater ease. The perfect solution: gears when you need them, and all the fun of riding with a fixed drivetrain. 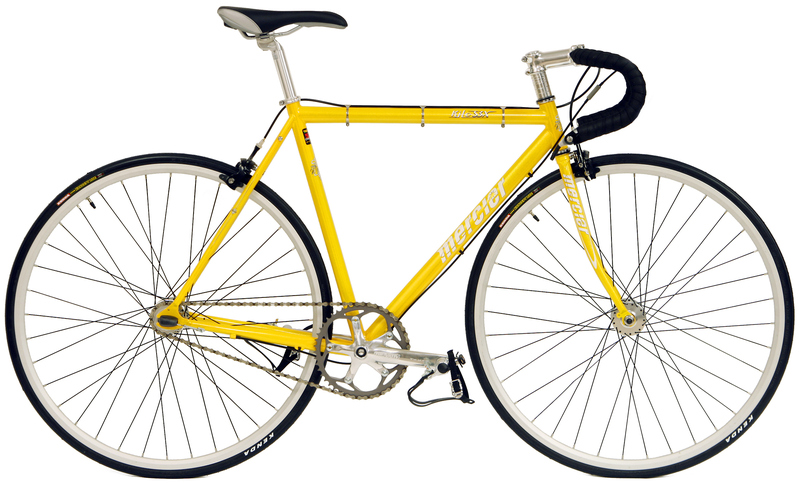 Extremely limited shipment of these incredibly fun, durable and versatile, three-speed-fixed-gear track bikes. We are blowing these out for Mercier as a special promotional deal. Handmade Track frames. Precision brazed and welded with high-grade Reynolds 520 steel. Reynolds makes their 520 steel from Custom Butted, Multishaped and tapered 4130 Chromoly. The CustomTrack fork features a strong, investment cast, flat-crown lugs. We highly recommend the installation of front and rear brakes (now included FREE with each bike) if you decide to convert your track bike to street use. 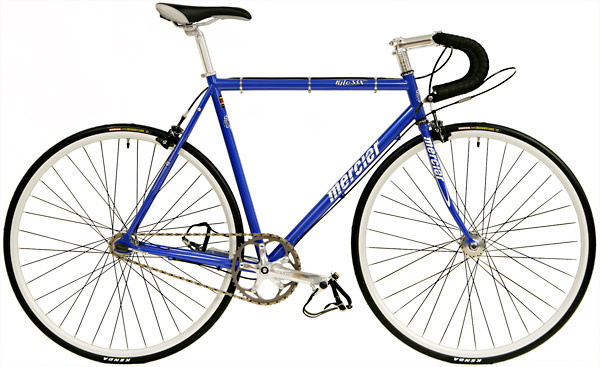 The "standover" is the distance from the floor to the upper surface of the top tube that is between ones legs when straddling the bicycle. Most riders want at least 1 to 1.5 inches between them and the hard chromoly steel top tube. If you are between sizes, keep in mind the smaller one will have lower handlebars and more agile handling. The larger one will have higher handlebars but less straddle room. Your personal preferences will determine your size. 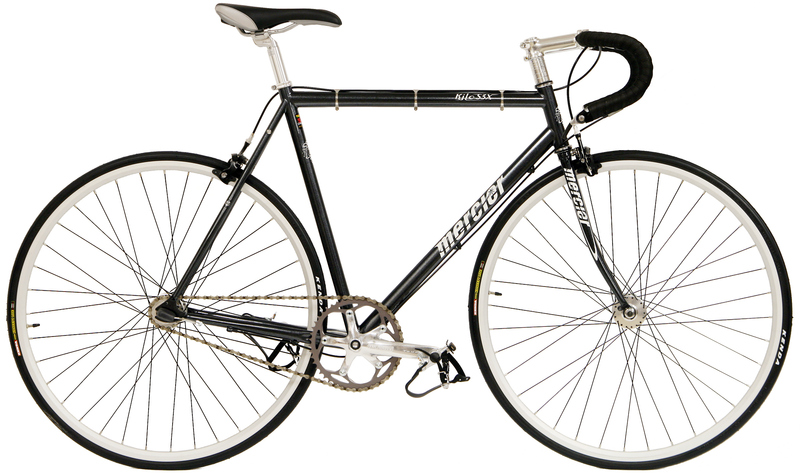 Another tip is to choose the bicycle that has a top tube length closest to the length of what you currently prefer. The final choice is up to you. The Kilometre TT or 'Kilo' is three and a half laps long and is considered by many to be the most painful event in track racing. From a held start, the rider will sprint at full effort for a little over a minute. Crankset TruVativ Touro 165mm aluminum arms, PowerSpline, 130 BCD, 48T 3/32"
Stem Forged Aluminum, O degree, Removable Clamp, Silver Finish, Threadless 1"
Instock, Limited Qtys - SAVE Almost 60% OFF + Free Shipping* to 48 states!